... But in reality, there's a lot more behind it. This store was planned to be a Pathmark. 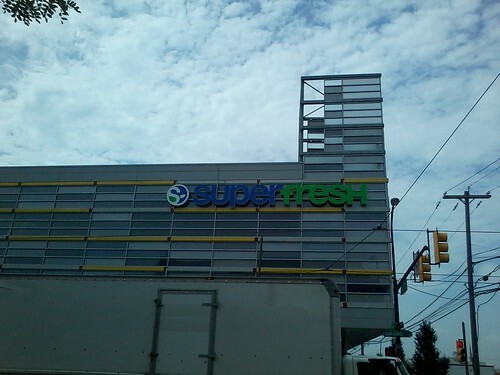 It sat empty for around three years, with the Pathmark logos up and all... but in 2010, A&P corporate decided to change it to Superfresh to suit the neighborhood. This store opened a year later, in 2011, with the original Fresh 1.0 decor with Superfresh aspects... which was unheard of at the time. Fresh 2.0-era Pharmacy signs and Fresh 3.0-era Supermarket signs... Why? This was one of the few Superfresh stores to have double-decker carts... scratch that. 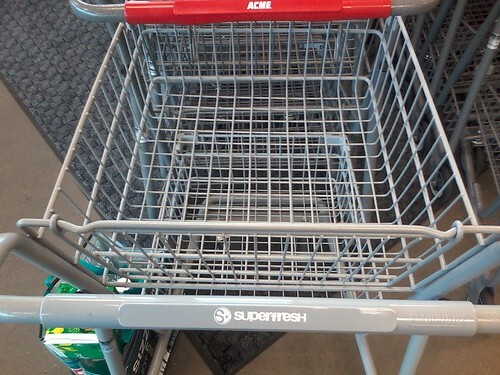 This was one of the only A&P stores to have double-decker (okay... "two-basket") carts... most used only the larger Technibilts that were at least a decade old. 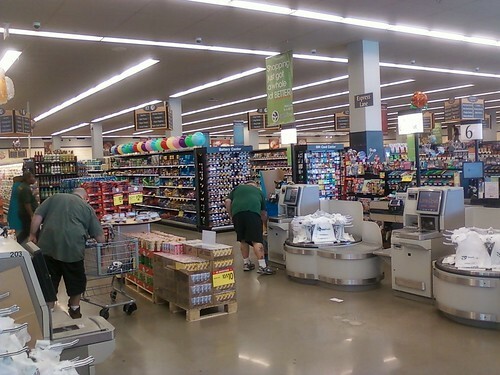 Polished floors, large carts, and deluxe self-checkouts are all big hits with the crowd. Shopping did just get a whole lot better! Only thing is... why Fresh 1.0? From the outside facade, this place could definitely take a Fresh 3.0! Although this store got deluxe fixtures, one thing that lacks is the decor. It uses a third-rate Fresh 1.0 decor, with no moldings... just paint. The tour stops short here because of the lack of photos of the store... 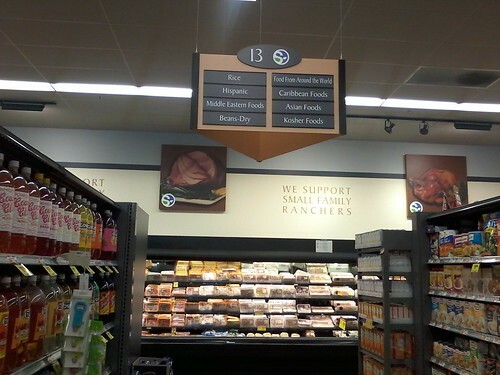 But hey, at least we get a look at the great Meat and Soda aisle! For reference, this store isn't really a 'big whoop'... it's just a rather interesting 2000's store! When you're wondering about the inconsistent SuperFresh/pharmacy signage, is it possible that the pharmacy sign was from a closed older store? 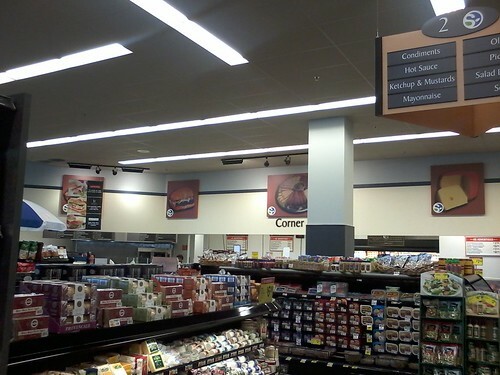 I know A&P would take interior items like aisle markers from one store to another when the first closed, so is it possible they did the same with exterior signage? I guess there's more to hook up with lit signage, though, so it's not as easy to retrofit. Possibly... I could see it happening, but at the same time not. 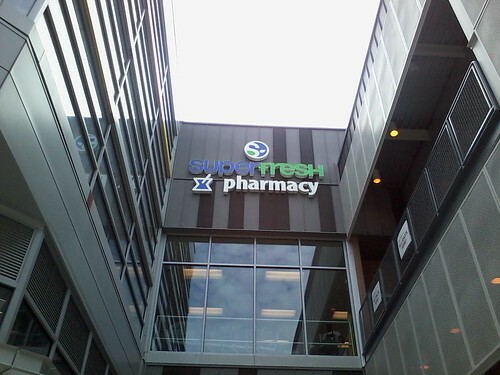 (Most stores with Fresh 2.0 decor retained their 90's-style Pharmacy and department signage). Only thing I could see if it was left over from another store was if it was a Pathmark pharmacy sign (as the building was originally a Pathmark prior to opening). I'll have to see if there are any stores with 3D lettering for Pharmacy... interesting to see where it's from!